Once upon a time, there was a general manager in a downtown high-rise who had the final say over all new hires at her location. Although she realized how critical it was to identify and hire the best and the brightest talent for her firm, she really didn’t like interviewing all that much. First, she felt fairly uncomfortable having to ask all the questions and direct the whole conversation. (Those moments of awkward silence bothered her most.) Second, she wasn’t always sure of how to interpret a candidate’s responses, but she felt that digging deeper was inappropriate lest she be accused of prying. Third, and most important, she really resented the fact that job applicants were so schooled and rehearsed in their responses. ‘‘There are just too many interviewing books and training tools available that teach people the right things to say. After a while, all their responses start sounding the same, and I don’t feel like I’m actually getting to know the real person,’’ she thought. Included in this revised and updated edition are new material on background checks, specific challenges posed by the up-and-coming millennial generation, and ideas for reinventing the employment application to gather more in-depth information than ever before. 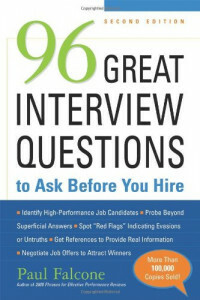 Packed with insightful questions, this book serves as a ready reference for both managers and human resources professionals alike.